Throw in four primary colors onto a painting palette and mix randomly. Whatever combination you come up with, there will be a Mexican rice that catches the spirit of those tones. Red rice, cooked in a rich base of tomato puree, onion and garlic, and sometimes chopped vegetables. Depending on the cook and the style, sometimes red rice may end up a bit on the orange side. Green rice, either based on Poblano chile, cilantro, parsley or a combination of those, giving a beautiful range of flavors along those grassy lines. Black rice, seasoned with cooking broth from beans in the pot. White rice, the classic yet flavorful Mexican take that can be an unpretentious yet comforting side to almost anything. And we are not even getting started. What many people don’t know is that Mexico also has its versions of Yellow rice. From the two main kinds of Yellow rice in Mexican cooking, one has a saffron base and the other an achiote or annatto seeds base. Ironically, although saffron was brought to Mexico by the Spaniards almost five centuries ago and achiote seeds are native to Mexico, it is the saffron based rice which is considered to be the Traditional Yellow Rice in regions like Yucatán. 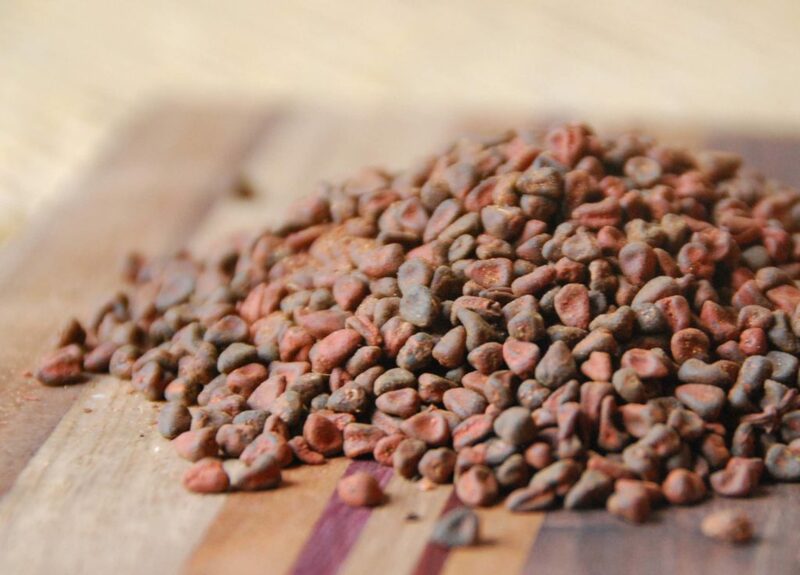 With a similar color, and the same range of flavors, achiote seeds are a great substitute. The difference aside from price, is the way in which both ingredients are used to bring out their unique flavors, aromas and colors, when making rice. …and added to the rice after it has been sauteed in oil and the broth poured on top…. Achiote seeds, instead, are sauteed in oil for 2 to 3 minutes. Once they paint the oil and let out their flavors, they are removed with a slotted spoon before they become too bitter and right before the rice is poured in the pan. Some cooks dilute powdered achiote seeds in water, which can also be found in some stores, and do the same as with saffron. I prefer the version that uses the whole seeds much more. Both ingredients, one from the Old World and one from the New World, have hard to describe flavors that somehow escape my words. But let me give it a shot: A bit smokey, a bit pungent, a bit bitter and strong, with a defined personality. What’s more, both ingredients help make an exotic, beautiful and tasty Yellow rice. Here is a take on the saffron based rice that I love and that won over a great crowd. Try it, then you can tell me if it is really that good, or it may very well be that the great crowd had been waiting too long to eat during class, and that’s why they liked it so. 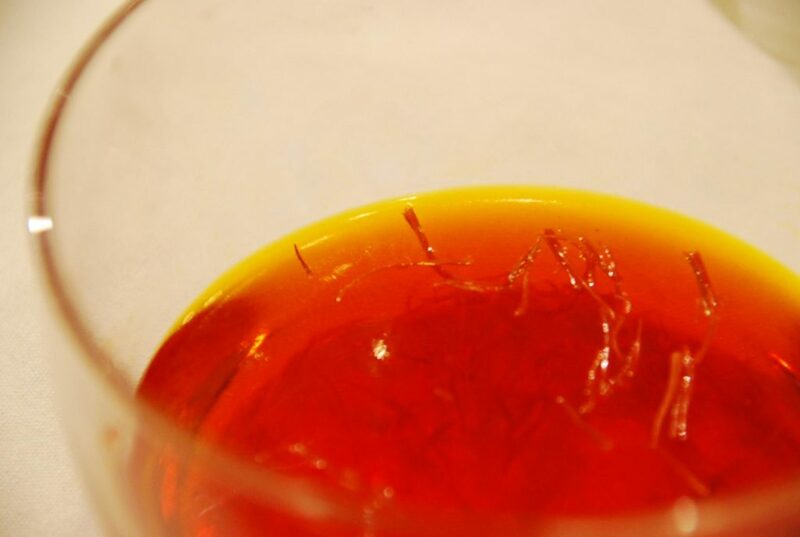 Place saffron threads in a small mixing bowl along with the boiling hot water. Mix and let soak for 10 to 15 minutes. Place rice in a bowl, cover with very hot water, and let soak for 5 to 10 minutes. Drain, rinse with cold water, and drain thoroughly. Heat the oil in a 3 to 4 quart pan over medium-high heat. (If you are using achiote seeds instead of saffron, just let a teaspoon of them cook in the oil for 2 to 3 minutes before adding the rice). Once the oil is hot, add the dried rice and saute for 1 to 2 minutes. Incorporate the onion, tomato, and garlic, stir, and continue to cook until the rice changes color to a milky white. It should sound and feel heavier, as if you were moving sand in the pot, about 4 to 5 more minutes. Pour in the chicken broth, saffron mix, and salt and stir everything together. When the liquid starts to boil, cover the pot, lower the heat to low and continue cooking for about 20 more minutes, or until the rice is cooked through and the liquid has been mostly absorbed. If the grains don't seem soft and cooked through, add a bit more chicken stock or water and let it cook for another 5 minutes or so. Turn the heat off and let it sit covered for 5 to 10 minutes. Fluff with a fork and serve. Rice can be made ahead of time and reheated later the same day. Before reheating, add 1 tablespoon of water and heat, covered over the lowest heat possible. Once it has cooled down, it can be kept in a closed container in the refrigerator for up to 2 days. I attempted to make this a while back and found out that Saffron is not in my families taste. I must have done something wrong as the rice had a metallic taste. I’m sure if I had gotten it right it would have been great. I have both books and this is the only recipe I didn’t care for. Oh I’m so sorry to hear this, Randy. Saffron may not be to everyone’s taste, but I’m glad you enjoy all the other recipes. And I hope you keep having fun in the kitchen! Thank you for the reply, Pati. Love the show on Create TV! Love to see your boys helping in the kitchen. 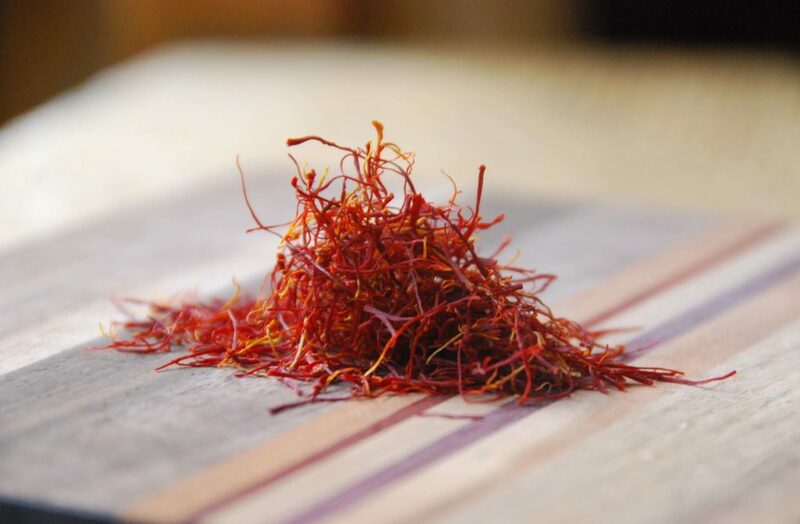 What is the difference in favor between saffron and achiote seeds? Haven’t cooked with either of them before. They are a bit similar, saffron, however seems to me to be a bit more smokey. Para el arroz amarillo – con saffron – cual tipo de arroz es el major, o el mas recomendable? Can you share a Mexican rice dish that I could make for 50 people? I’ve made this several times now—the whole family loves it. It’s so easy to make and tastes great! It’s definitely a go-to recipe at our house. I wanted to make this rice so I went to the Latin section of my grocery store and found the powdered achiote, and the seeds so I got both to give them a try. I also found a little bag of something that was labled “zaffron” that looked like dried flowers. It was very inexpensive, only about a dollar, and I was just wondering if it was the same thing as saffron. I always hear that saffron is the most expensive spice and was just wondering if it was too good to be true. A little help? Hm… If it says “zaffron” and it is $1.00 most likely it is not pure saffron, but maybe saffron mixed with other ingredients combined with it being not the most refined… I don’t think it will be harmful, but probably not the taste you’d expect from true, pure saffron. I spent a college semester in Mexico. I was a poli sci major with a concentration in international relations. I went Mexico to improve my fluency in Spanish. I lived with a professor’s family and dined well. One of my favorite dishes was a green rice that was so spicy. It was served as a first course. I would appreciate it if you would post the recipe. The rice was almost like a risotto; Perhaps that was because the denota was hakf Italian. And I am wondering if it had a touch of cheese. Many thanks! You are talking about Green Rice and it is my favorite of all of the Mexican style rices, I will try to post a recipe soon. There are many versions, some with cilantro, parsley, and different kinds of green chiles… And yesÂ¡ Adding cheese on top is a great and popular option after it is cooked. This is delicious, now I need to practice some restraint. I can eat this rice all day, every day. Thank you, thank you, thank you. I’m apologizing for using the wrong name (Elyse)in my intro to my comment earlier. I looked above not thinking about it too clearly. First, I wanted to say that I love this rice. I made it with your Mole’ recipe for Thanksgiving and it was a hit. But, I would recommend that you include instructions on how to use the achiote seeds. I found some at a International market in Fort Wayne, IN surprisingly, and I was excited to try it this way. Unfortunately, it was on Thanksgiving day that I realized you didn’t explain how to use them and went to another website. It said that they needed to soak overnight, and I didn’t have time. I had to rush out and buy saffron only an hour and half before the meal, which like you said is expensive. Needless to say, I love the recipe and I’ll have saffron to make it today. 🙂 This time I’m gonna make Mahi Mahi tacos with it. Thx! I added it in there! Thanks. You just need to let the achiote seeds fry in a couple tablespoons of oil for a couple minutes over medium high heat, and remove them before adding the rice… Enjoy! A short decade ago Mexican yellow rice kept my then 2 year old son alive for what seemed like forever. Did he even eat anything else? So, there must be something quite primal in the stuff. Se ve delicioso, Pati! Ahora que me recupere y entre de nuevo a la cocina, haré el intento. A mÃ­ nunca me ha salido bien. Hahaha! With rice its just a matter of messing it up a couple of times… once you get it right, you never mess it up again… Give it a try!